Regular fire drills were credited with saving the lives of an unknown number of children when Ridgely School caught fire in the middle of classes on Nov. 15, 1916. The blaze began when sparks from the school’s coal furnace flew out of the chimney and ignited wooden shingles on the school roof, the Illinois State Register reported. Miss Edith Sutton, a teacher, whose room is located on the second floor just under the part of the roof which first caught fire, was the first one to discover the blaze. She notified the principal, Prof. J. Montgomery Humer, who turned on the fire drill bell. Without a single mishap, all of the students marched from the burning building in perfect order. The 15-room school, which took up the entire east side of the 2000 block of North Eighth Street, housed 520 students. The fire began in the school’s western section, built by the village of Ridgely in 1900. The eastern half of the building, constructed by the Springfield School District in 1912, had a slate roof, but the flames spread beneath the entire roof, which caved in. The school board had been aware the roof might catch fire, according to the Register’s story. Several times within the past few years, sparks from the school’s flues set fire to the shingle roof, but each time the present janitor (George Fowkes – ed.) discovered the fire in time to extinguish it without calling the fire department. Because of former fires the board of education last year discussed the question of having a slate roof placed on the old part of the building, but the improvement was not made because of lack of money. Ridgely’s students were all back in class within three weeks. The four younger grades were accommodated in the newer part of the school, which received a temporary roof. Fifth through eighth grades were relocated a few blocks south to Converse Junior High School, Eighth Street and Eastman Avenue. 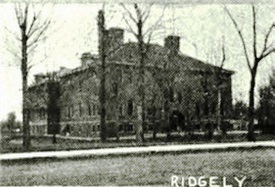 Following $30,000 worth of remodeling, Ridgely reopened fully in October 1917. The day after the fire, the Register’s editorial page commended school authorities for insisting on fire drill practice. Principal Humer by his practical demonstration yesterday has shown the people of Springfield that the fire drill is not a theory, but accomplishes what it is intended to do. Although the loss of the Ridgely school will result in some inconvenience, yet the fact that no lives were lost and no injuries sustained by the boys and girls of this school, is cause for city-wide rejoicing. This entry was posted in Buildings, Children, Disasters, Education, Fires, Schools and school districts. Bookmark the permalink.